The Con Thien AO (TAOR) was near the DMZ - 17th Parallel - and just South of the Ben Hai River, the natural divide between North and South Vietnam. 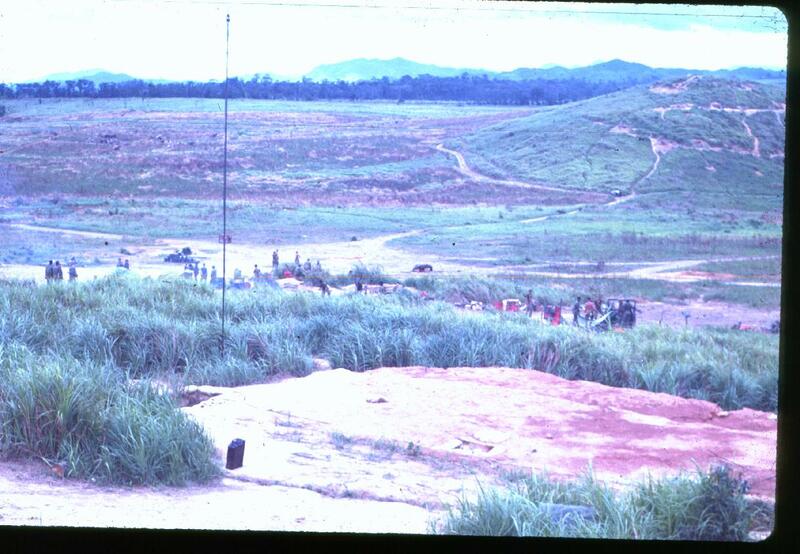 Actually, the DMZ was that area 5 KM on each side of the Ben Hai. 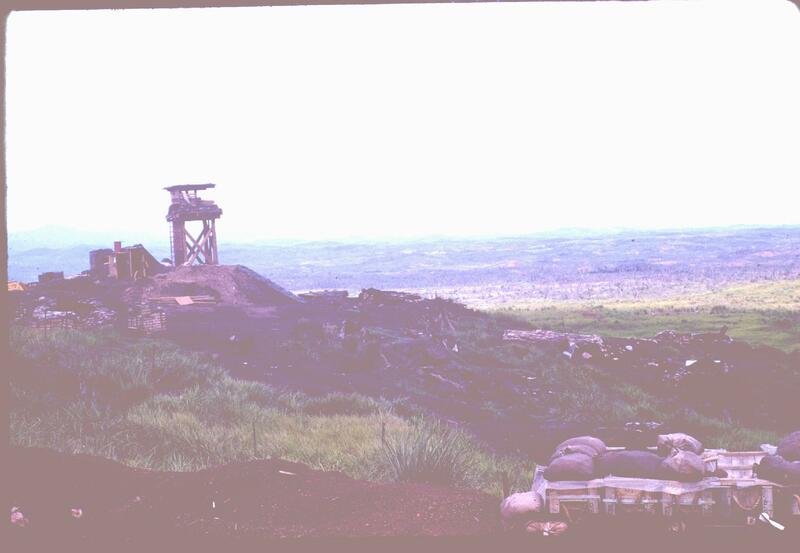 The TAOR included quite a bit of the Southern part of the DMZ and even part of the Ben Hai River, although during our stay there, we did not have defensive positions that far North. 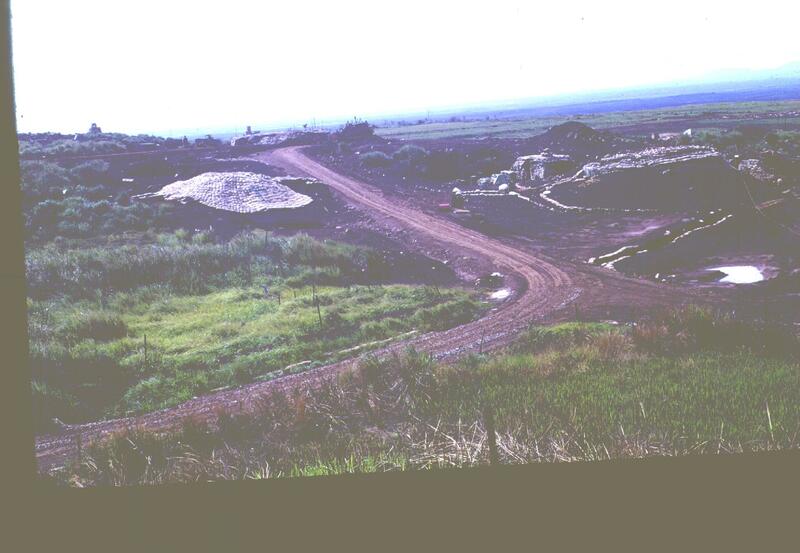 The Battalion CP was located in a bunker on Hill 158 - which originally built by the French forces. 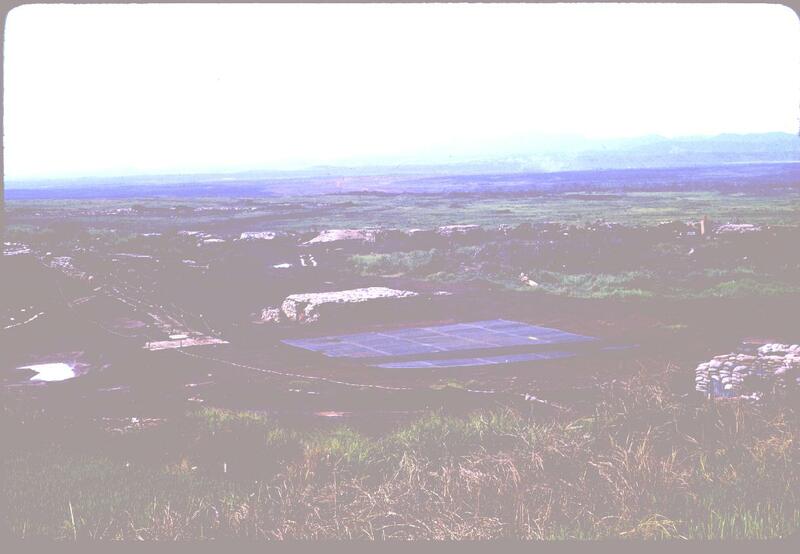 As a matter of fact, many of their mine fields remained - but no maps of their placement. So, throughout the area around the CP and other strong points, there were red flag marked barbed wire fenced in areas around the mine area. 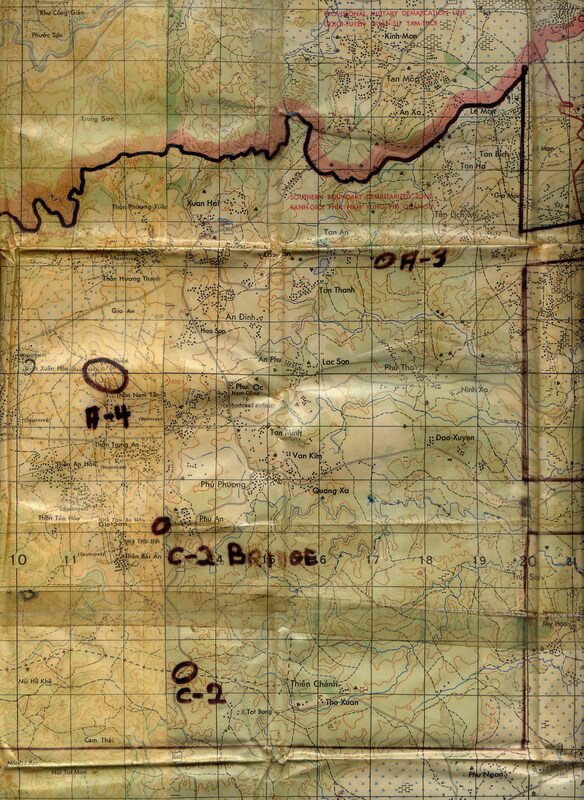 The map and pictures below show some of the area, and some pictures of an ArcLight run our CO, LtCol Archie Van Winkle, had requested. An ArcLight is a high altitude B52 strike using 500 (or maybe 1,000 ~ 2,000?) pound bombs. 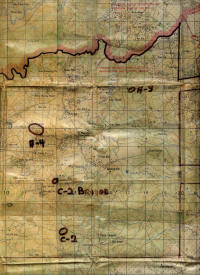 This is a map of the 1st Battalion, 1st Marines TAOR at Con Thien. 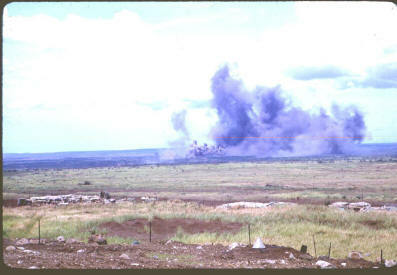 A-4 was the Battalion CP. Note that our TAOR did go right up to and include the Ben Hai River. Company locations included A-3, C-2 Bridge and C-2. The Area to the North and East was sometimes referred to as the "Agriculture Center" or the "Market Place". This is where we had the ArcLight mission bomb. 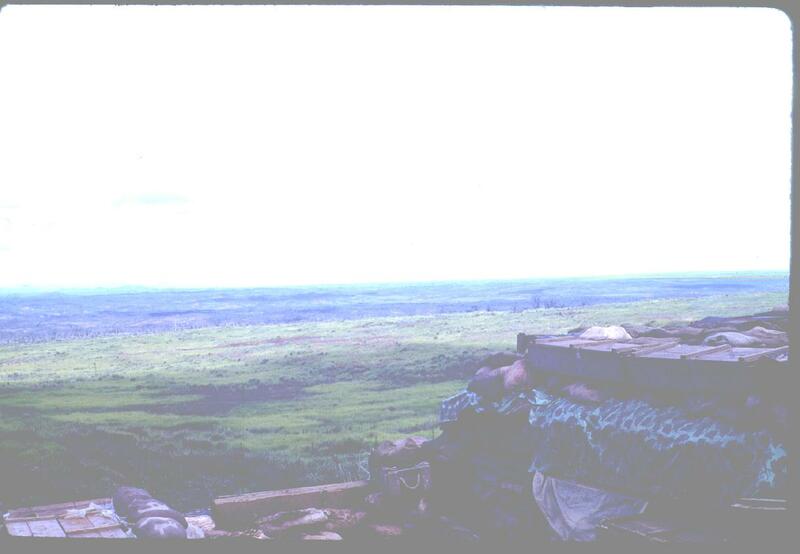 Even though most of the NVA had withdrawn back across the border or over into Laos, we still did not go out on any day work or night work (patrols) unless at full platoon size or greater. 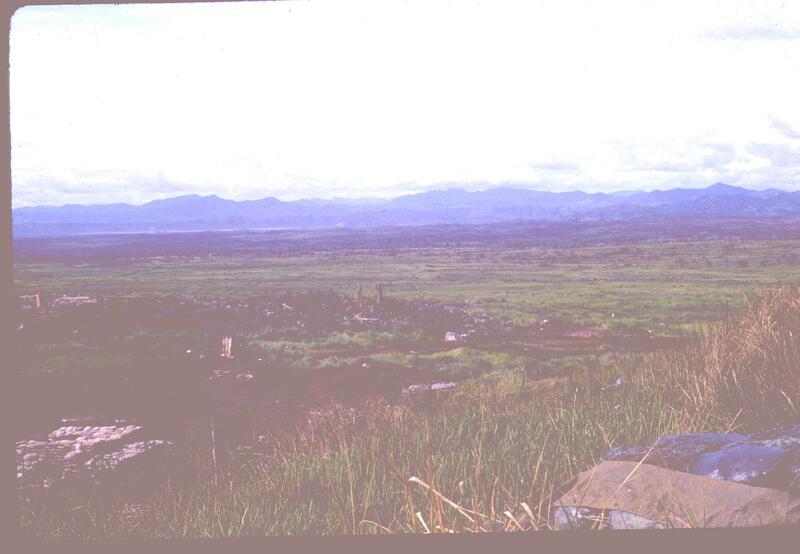 The whole area of Con Thien, extended in all directions, was a free-fire zone. 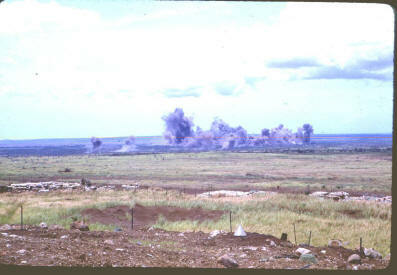 All Civilians had been removed - for the most part. This included near the Cam Lo area, although there were still Civilian communities there, and restrictions regarding artillery, mortar and small arms fire were observed - again, for the most part. 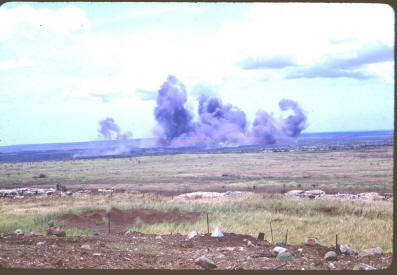 A4 (Battalion headquarters) looking North. The tower was an OP and also held some range finding electronics - forerunners of our laser range finders today. Just on the other side of the bunker was an Air Force (I think) position of 2 or 3 electronic techs that had a laser rangefinder. 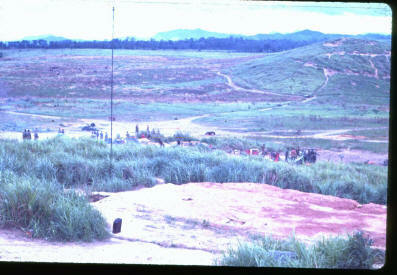 Tried it out one day by calling in an artillery mission to a target just North of the Ben Hai (old NVA bunker complex). I had distance down to one/third of a meter (according to the system) and exact direction which I fed to the COC. I heard the fire mission, but never saw any hits - even tried a smoke round, but no success. Others also had the same result. So.. not sure what problem was, but system definitely needed some work..
A4 again - taken just North of the CP looking North toward Ben Hai river. 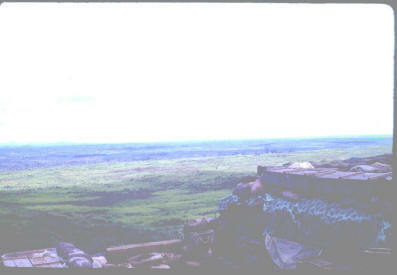 A4 again - actually, on top of the bunker looking East toward the South China Sea - close enough to get Naval Gunfire support, if needed and if available on station (usually were). The bunkers were well reinforced with steel matting and layers of sandbags on top of some huge wood beams - some 2 feet or greater in diameter. 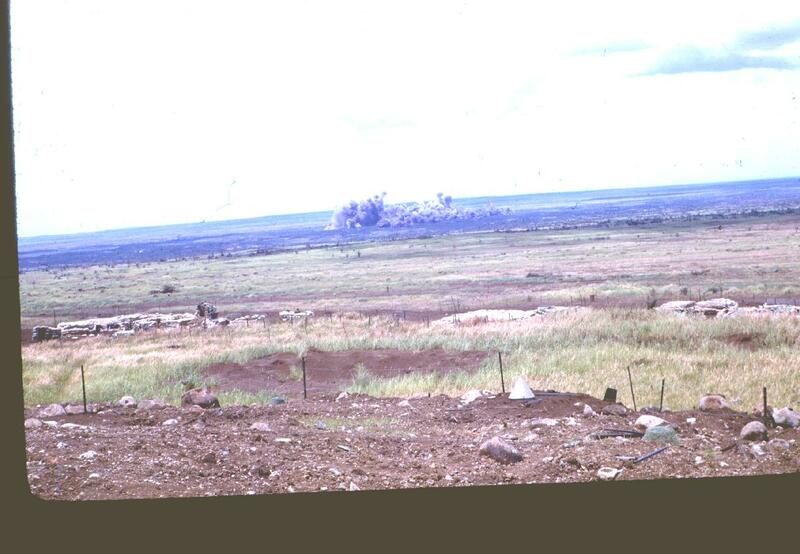 The heaviest artillery the NVA had were 130's - and these bunkers (and the ones at Khe Sahn) could easily withstand a direct hit. You wouldn't hear anything for a while, but you would be alive. A4 LZ - During the heavy fighting of a few months ago, all resupplies had to come via air (helicopters). During our stay this time, we did have some ground traffic - truck convoys from Dong Ha, if I remember right. Usually pretty well guarded with available air cover if necessary. 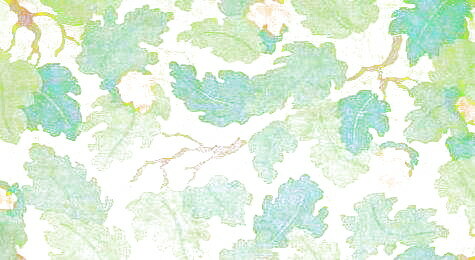 This is one of the roads through A4 - the white area in the upper left is the sand-bagged roof of the chapel. Chapel was also well underground with a reinforced roof of large wood beams, steel matting and sand bags. Inside the chapel were rows of benches and a podium that was used by whatever denomination Priest, Minister, Rabbi (never saw one), Buddhist Priest (again, never saw one) or Witch Doctor was available for services. Also doubled as an safe aid station for wounded during artillery barrages. Near Cam Lo - about 5 Klicks (5000 meters) South of C-2. Staging area for a company-sized sweep of the area - even though South of our TAOR. Near Route 9. I can't remember much about the sweep - we did run into some civilians along the way, and on Route 9 - but little signs of any recent NVA activity. ArcLight - This last series of pictures are shots of an ArcLight that was ordered on an area centered around the Agricultural Development Center (YD 0869 on the 1:50,000 Cam Lo Vietnam map). The Center, near the Southern boundary of the DMZ, is about 2 Klicks East of A4, and historically, housed underground bunkers, weapons caches, etc. ArcLight - At any rate, a lot of us took our cameras outside, set up and snapped pictures of the ArcLight. 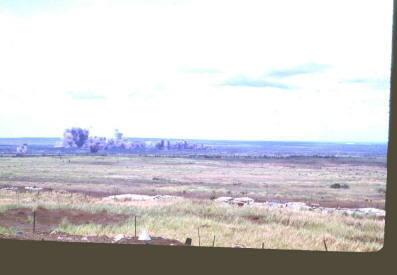 The shots sort of show the beginning, middle and ending of the strike; here, the bombs are still dropping. ArcLight - Bomb run pretty much over - now just the growing dust clouds. 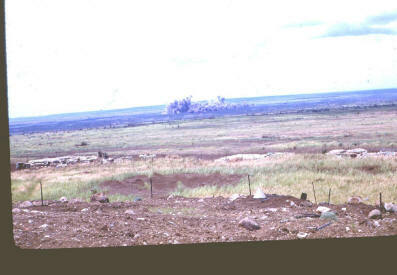 During the whole run, we never saw or heard the B-52 bombers - Assumed they were above 100,000 feet, but not sure. 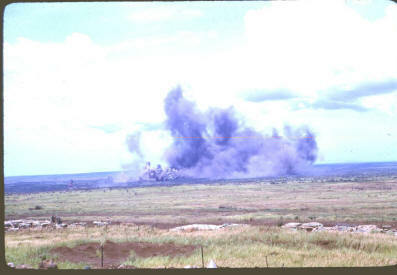 ArcLight - Dust cloud still growing - no secondary explosions noted yet..
ArcLight - Notice the area just to the left of the larger dust cloud - may be some secondary explosions - although difficult to pin point because of continuing rumble of ArcLight bombs. ArcLight - Final shot -smaller clouds still evident to left. Subsequent examination of area did not reveal any debris from NVA caches. It should be noted that we - our Battalion - did not order the ArcLight just so we could take pictures - although, since we knew when the strike was coming, and some of us carried cameras - why not? Later on, in another sweep near the Center, we did find a large weapons and ammunition cache - B-40's, B-42's (Rocket Propelled Grenades and Launchers), 7.62 ammo, C-3 explosives, clothing (mostly uniforms), etc. Some rice, but not much..